Have you ever noticed that Mail app registers a message as “read” after it has been clicked? The automatic “mark as read” feature makes it easy to quickly skim through a bunch of emails, but Mail doesn’t offer much control over the the delay for when messages are marked read. Another option is called TruePreview, it’s a free Mail plugin that gives you control over how Mail app handles messages and their read behavior. 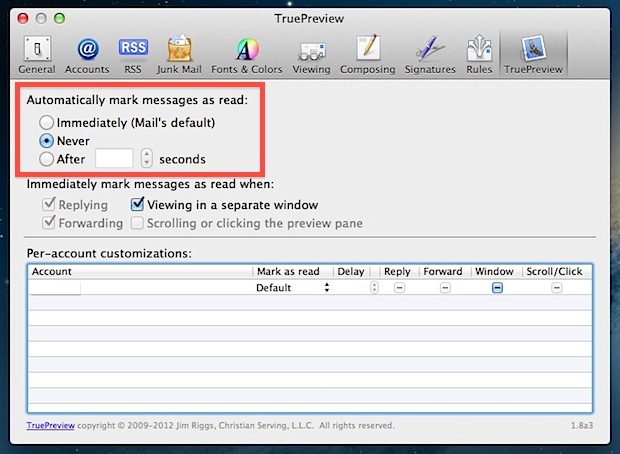 With TruePreview, you can set messages to mark as read after a delay, disable the automatic mark as read feature completely, or restore to default settings, it also allows for these customizations to be made on a per account basis, allowing for read behavior to change depending on email addresses. Deleting that folder and restarting Mail will uninstall TruePreview. Removing the delay with these latter commands seems to only impact Conversation view, according to Macworld. TruePreview doesn’t work with the version of Mail that is in Mountain Lion. And, using the ‘defaults’ command doesn’t work either. Any tips? After installing Security Update for Snow Leopard, no version of TruePreview works anymore. Be warned. Latest version works for me on Mountain Lion. The command line version works perfectly in Mavericks. Does anyone know if TruePreview is still maintenaned or if there is any other way to not mark mail as read when viewed? I’d like to mark it read with shortcut/hotkey. Whoever suggested to change the email preview from 2 to 1 lines is a genius. It worked! Thank you.